In the first installment of Saving Money in and Around San Francisco, I discussed the first four days of our six-day northern California adventure. 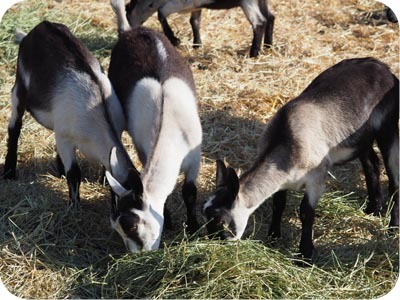 I think my wife and I did a good job experiencing the greater San Francisco area and its goats without breaking the bank. 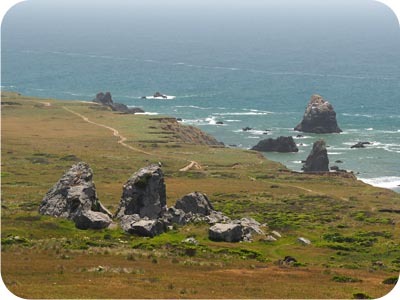 Of course, there is more to northern California than bridges, museums, and goats. There’s also wine, ocean, redwoods, and beer. And if you’re lucky like me, there might even be friends! 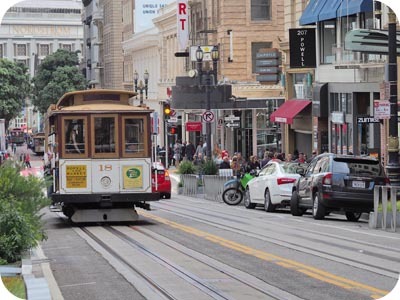 In San Francisco, we used public transportation to get around. The BART train will take you from the airport to downtown San Francisco and back for under $20. When it was time to leave town for wide open spaces, we picked up a rental car. We could have rented one for the week, but parking reportedly costs $30 to $50 near the hotel, and public transportation works well in the city. A cable car is more fun than a rental Camry any day. On our first of three days with the rental, we headed straight to Napa. I very rarely drink wine. My wife enjoys wine but is not exactly a connoisseur. Her standard review is a well considered “this wine tastes like wine.” But we were in the area, and wanted to see the town, and I’m glad we did. 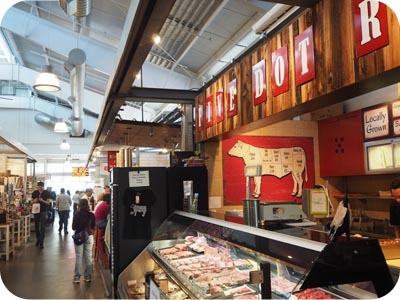 We walked around quaint downtown Napa and visited the Oxbow Public Market. The friendly volunteers at the tourist information center directed us to a tasty lunch spot. Like vegetarians at a chop house, I enjoyed a pint of California Special Bitter brewed onsite, while my wife had a tasty Bloody Mary. In Napa, California. We ordered the lunch specials, and no wine, and were on our way to the next stop. We programmed the GPS (we brought our own) to a grocery store in Petaluma. We picked up the evening’s provisions, namely snacks and beverages, and reprogrammed the Garmin to Lagunitas Brewing. I am aware that modern phones can do navigation, but I still prefer to have a dedicated GPS device. Also, my Republic Wireless plan refunds me for data I don’t use, and I usually have a total bill of $13 to $15 a month. Google Maps can be downloaded and cached in advance to avoid using data, which is a good trick to use when visiting a new town. We were pretty much winging it out there, without a schedule or itinerary, so we missed out on Lagunitas’ afternoon tours with free beer sampling. But I can afford to buy a beer, so I quenched my late afternoon thirst with a Lagunitas Wit Stoopid and took the 5:00 p.m. free tour. Our spunky tour guide teased us with a stack of sampling cups that she carried with her for the entire 45 minutes. Surely, those were destined to be filled with fresh beer at some point along the tour. Maybe at the tour’s end? Nope. And that was alright; we had goats to see. Friendship can make you happy and save you money. Having lots of time with little ground to cover, we started our morning by heading to Bodega Bay, where we drove down to Bodega Head and hiked around, staring out at the expansive Pacific. We worked up a hunger for some breakfast, but the Tides was no longer serving, so we pressed on. Just up the road, Diekmann’s Bay Store delivered with a tasty breakfast burrito and bagel with salmon, cream cheese and veggies. It was just what the doctor ordered for about a quarter of the price of a lunch at the Tides. Further on up the road, we saw Goat Rock and a pair of rocks that were supposedly rubbed smooth by woolly mammoth butts. For perspective, there’s a man towards the right end of the peak of the second of the two larger rocks in the foreground. The views along Highway 1 were spectacular. In the afternoon, we made our way to Armstrong State Natural Reserve. There was an $8 entrance fee that we would have gladly paid if we had more time to spend there. We were looking to stop quick and see some obligatory redwoods, which we were able to do by parking at the visitors center and taking a short hike up the hill. A few clicks of the camera, and we were off to see our friends. When I told my friend a couple months ago that I would be in the area, she graciously invited us to stay with them. After four or five days of nothing but just me, my wife is usually jonesing for some girl time or really any social interaction with someone who’s not me, so we gladly accepted the offer of a free place to stay. Over the course of two days and nights, we had an awesome time reminiscing and getting to know her family. Living in the heart of wine country, our friends frequently have guests, and they know how to treat them well. To show our appreciation, we brought a goat cheese appetizer (from Patty’s goats), a Lagunitas shirt for the little boy (from the clearance rack (please don’t tell)), and some of the better beers my home state brews up. 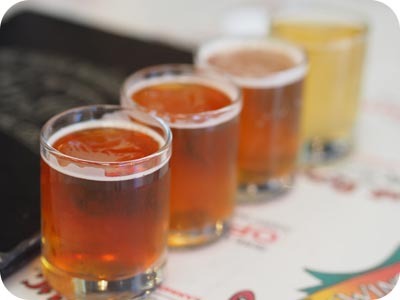 Why bring beer to northern California? Isn’t that like bringing cheese to Wisconsin? There are some excellent breweries north of San Francisco, but I wanted to share some of my local best with my new friend. More truthfully, I wanted to bring some sought-after beers from California home with me and I have a box designed specifically for shipping bottles. Using a rewards credit card gave me one free checked bag. That bag held the box that held the beers I would be bringing back. One of those beers is called Pliny the Elder from Russian River Brewing Company, which happens to be minutes away from our friends’ home. This particular beer has topped many a list of the best and most wanted beers in the world. People pay good money to buy it on the “gray market,” and have it shipped across the country or around the world. I was able to drink it at the source for $3.75 a pint. You can’t beat that with a redwood stick. When you are in wine country, surrounded by never-ending rows of grape vines and winery mansions, there’s one thing you pretty much have to do. That’s right, go to Goodwill. With all that old money, you’re bound to find some quality goods at unbeatable prices. The Santa Rosa Goodwill did not disappoint. For about $30, we picked up seven or eight perfectly new-looking pants and shirts with names like North Face, American Apparel , and Banana Republic. This made my wife very happy, and I certainly wasn’t complaining. There is one other thing you probably ought to do when in wine country. Yes, visit a winery. It just so happened that our friends belonged to a wine club near Healdsburg and had some wine ready to be picked up. Healdsburg also happens to have a beautiful downtown area that is home to Bear Republic Brewing Co. After a hearty lunch and a few three-ounce samples of their sours, we headed to the winery. As guests of our friends, we were comped a wine sampling. The vinery grounds and gardens were a sight to behold. The one-ounce samples of wine tasted like wine and I struggled mightily to convince myself I could detect one or two of the half-dozen flavors the descriptions told me I should be experiencing. I’m more or less indifferent to wine. I don’t love it or hate it, and I don’t have the discerning palate to appreciate it. To me, there is a much broader range of smells, flavors, and mouthfeel across and within different beer styles than there is with wine. But that’s just me; you do what works for you. All this wine and beer talk is making me thirsty. Let’s get back to the points I was going to make before I started hitting up breweries. Friendship can also save you money. Not only did we have more fun staying with friends than we would have had staying in a hotel room (or even two more nights at the goat farm), but their hospitality kept us from spending hundreds on lodging and meals. Of course, we did treat our hosts to a happy hour dinner at Third Street Aleworks, and we would gladly return the favor and host them the next time they’re in our neck of the woods. Looking back, it’s hard to believe we packed this much into six days. And I’m happy to say we were able to do much of what we wanted to do, while having a great time without spending a ton of money. If you missed Part I, check it out here. What strategies have you employed to save money in San Francisco or other major cities? Sounds like a fantastic trip and great to catch up with an old friend! The picture of the redwoods is awesome. Also, I love all the beer drinking you did in wine country ;)! I’m somewhat indifferent to wine as well. And I did enjoy all the breweries around SF. Just recently I noticed my local grocer had Hell or High Watermelon from 21st Amendment (brewed in SF). Wheat beers aren’t my first choice, but I picked some up to reminisce SF. We tried to have dinner at 21st Amendment but it was a Giants game night, and the brewery, 2 blocks north of the stadium, was absurdly overcrowded. I do have access to their canned beers. Solid label art, and the contents are pretty tasty. Sounds like a good time. I always say that I only drink wine if beer is unavailable. Awesome, thanks for sharing! 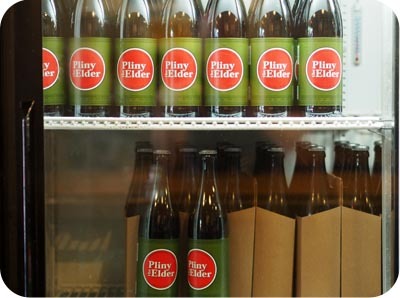 Pliny the Elder is one of my favorites too, but it’s extremely hard to get. Who needs wine tasting with so many other things to do there? Also, it’s nice to see one of the Redwood parks other than Muir Woods, which is nice, but due to the proximity to SF it’s very, very crowded with tourists. 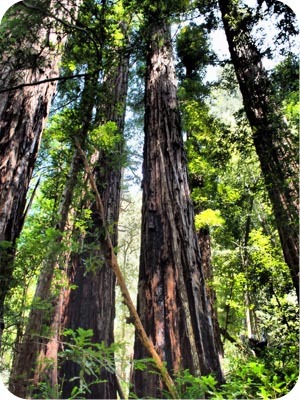 Sounds like you enjoyed the Redwoods further North! Next time I’m out that way, I’d love to get up to Redwood National Forest and Yosemite. We skipped Muir Woods for that reason. Our friends recommended Armstrong. Another benefit of friendship: local tips! I will have to track down a few of these – have tried a laguintas brew before but it has been awhile! Finding a way to ship them back is genius – nice work all around! 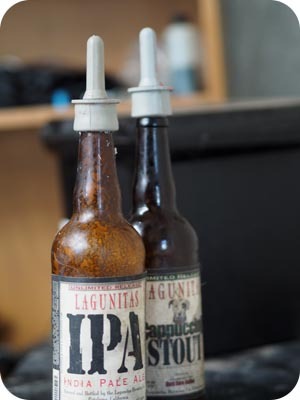 You can get Lagunitas pretty much everywhere now that Heineken owns half of it. Their distribution network will take it worldwide. The new Chicago brewery is pumping out tons of beer, and they’re building a huge brewery near Los Angeles. Their growth rate is insane! Who wrote this article? Who can take call with a Republic Wireless phone? And an anesthesiologist @ Goodwill? Was this a guest writer/ghost writer? Sounds like you guys had a great adventure. Which do you think was the best part of your trip? I’m going to say visiting Alcatraz at night was pretty spectacular. I always enjoy catching up with old friends, too. Another doctor who is not ashamed of entering a Goodwill!. 😉 It’s actually amazing how little (or no use) some of the clothing donated to local thrift stores. I will definitely make an effort to check out some of the Goodwills the next time I’m vacationing. There’s no shame in it; I’m proud of my finds. Got some sweet Tommy Bahama duds in Hawaii at a Goodwill a few years back. Enjoyed your post. I’ve been to Frisco a few times but didn’t know about the goats! Guess I’ll have to go back. It’s always a good idea to leave at least one cool thing off the itinerary when you visit a great place. Gotta have a good reason to go back someday! There is so much good coffee in SF– put down your soda next time and check out Philz! 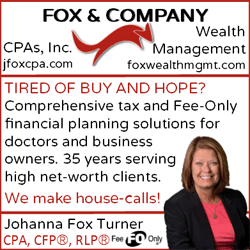 Pingback: Happiness is an Early Retirement | Passive Income M.D.